This article is Part 1 of a series on evaluating the ways to add Portfolio Insurance if you are anticipating a market correction or market decline. Most of us are probably in more Bullish positions, based on the last 12 months performance of the market. Every week new highs are being hit, and bullish stock and option traders have been doing well. Over the last 12 months, we have seen SPX (S&P 500 index) and SPY (S&P 500 ETF) gain over 17% (SEP 13th, 2016, SPY closed at $213.23 and is currently around $250.00). During that same time period, NDX (NASDAQ 100 index) and QQQ move up 26% (SEP 14th, 2016, QQQ at $115.85 to about $146.00). Sure, there were small hiccups here and there along the way, but the extended growth has led to many pundits, gurus and other stock prognosticators warning of a downturn and correction. A Look at the Most Basic Example. Let’s say we have a $1,000,000 account, and for the sake of argument let’s say 80% of that is invested in SPY. This is not an advisable allocation of funds, but it would have an unrealized gain of 17% as we just saw. So, $800,000 is invested in SPY. You are expecting a -10% market downturn, or a loss of -$80,000 on your investment. How can you protect against a -10% downturn? Well, how much do you want to protect? This is one of the points that is missing from the initial question. If you are comfortable only risking -5% of invested capital in a -10% decline, you could simply set a stop order (in this basic scenario) to close your shares of SPY if they drop -5% from the current value. With SPY at $250.00, we would set a stop at $237.50, -$12.50 from the current price. As long as that price is hit during the trading day, you would close out your position and only have a -5% loss from the current value – now a realized gain of $24.30 per share, or 11.8% if you had bought in and held from last year. BUT! We all know the dangers of stop orders. It is really just a market order that tells your broker: Close my position if the stock / security is anywhere below that price at any time. It is unlikely to happen with SPY, QQQ or a broad market ETF, but IF SPY gapped down -15% overnight – you don’t get to close the position at $237.50. Your order is triggered and you are closed out at whatever the market is offering…in this case, $212.50. You are now at a small loss on the total position from your original cost of $213.23. That is not what we want to see. Again, that is not likely to happen in this case. But, what if you wanted to stay in the position and not be automatically closed out – and at the same time protect against an expected decline? You would need an instrument, and the corresponding number of shares (or option contracts), that would gain $40,000 if you expected your portfolio to drop -$80,0000. We already talked about a Stop, which also includes a Trailing Stop. That is common protection #1. But if we want control of our position and not leave it subject to a set number or the risk of the stop being violated, we would look at a different approach. SPY is right around $250.00. 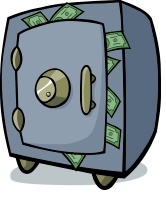 If we invested $800,000 (or 80% of our portfolio) into shares of SPY we would purchase 3,200 shares. What are the obvious hedges? Set a Stop at -5% ($237.50) or a Trailing Stop. We just covered the pros and cons of a simple stop. It’s free, yes, but can be violated. Sell out now, stay in Cash. This is always an advisable approach if you are considering a market downturn and you have hit your target for profit. Close out your bullish securities for gains or small losses, stay in cash and wait it out. But, we are looking for better solutions here, not the obvious. Buy shares of the inverse ETF which will gain as the market falls. Inverse ETFs will move counter market, allowing investors to potentially hedge a portfolio. ProShares Short S&P 500 (SH), an inverse ETF against SPY. SH is currently trading at $32.45. If SPY declines -10%, SH would rise +10%, or roughly $3.25 to $35.70. To counter half of the $80,000 loss on SPY we would need to purchase 12,307 shares of SH. This would be a total cost of $399,362.15. Well, that doesn’t work. First, we only have $200,000 of free capital in our $1,000,000 account. Second, if the decline does not happen and the stock moves up, we are losing money on the $400,000 investment. Third, it is just not that efficient. With this hedge we would have cut the loss in half to only -$40,000, or only -5% of our invested capital. This also represents only a -4% loss of the entire portfolio value. BUT, we would have to trade this on margin as we did not have the capital required to purchase that many shares of the inverse ETF. We would want to use some kind of leverage to better hedge the position. 4. Buy shares of Leveraged, Inverse ETFs to hedge the position. Percentage wise these securities will move twice or three times the amount of the movement in SPY. A -10% decrease in SPY should result in a +20% increase in SDS, or a 30% increase in SPXS. So how many shares would be needed to counter half of our -$80,000 loss on investment? So this is an easier pill to swallow, but it would still require an investment of just over $200,000, what is left in the portfolio, to cut the loss on SPY by 50%. What about using more leverage with the 3X Bear ETF? SPXS should rise +30% with the decline. This would be a gain of $11.21 to $48.58. Now at least we can afford to purchase the number of shares required to lower our loss to only -5%, or -$40,000. But, aren’t there better methods of leverage? Hey, this is why we use options! 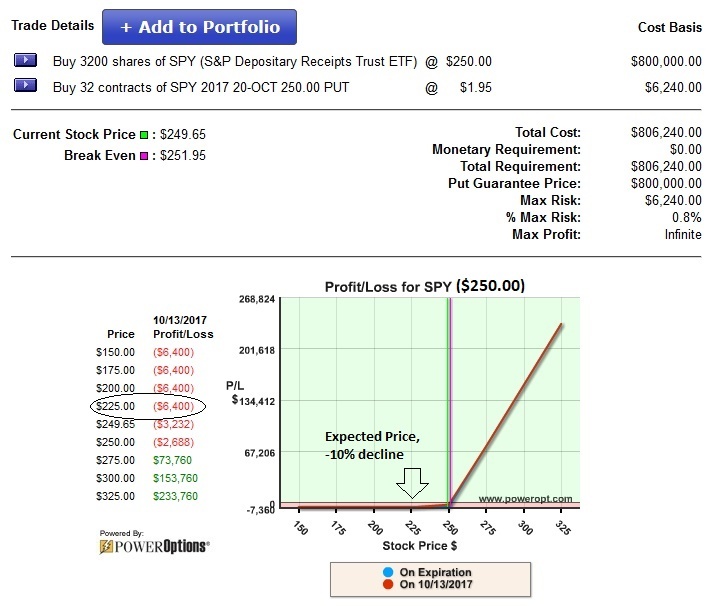 Option 5: Buy Puts directly on SPY. Put options are extremely useful for insuring or protecting stock directly, or a portfolio. As the stock or market falls, the put options gain in value. There is a cost, but options give us leverage for both bullish gains, bearish gains, or protecting Bullish or Bearish portfolios. If I wanted to hedge a position to counter 50% of the expected move, I might look at an At-the-Money put (close to the current stock price) with a Delta of 0.50 (would gain $0.50 for every -$1.00 drop in the stock price). Unlike purchasing shares of an inverse and leveraged ETF as a hedge, the put option has a defined expiration date. One put contract represents 100 shares of the underlying security. The listed price of $1.95 / contract would actually cost $195.00 to purchase 1 contract. 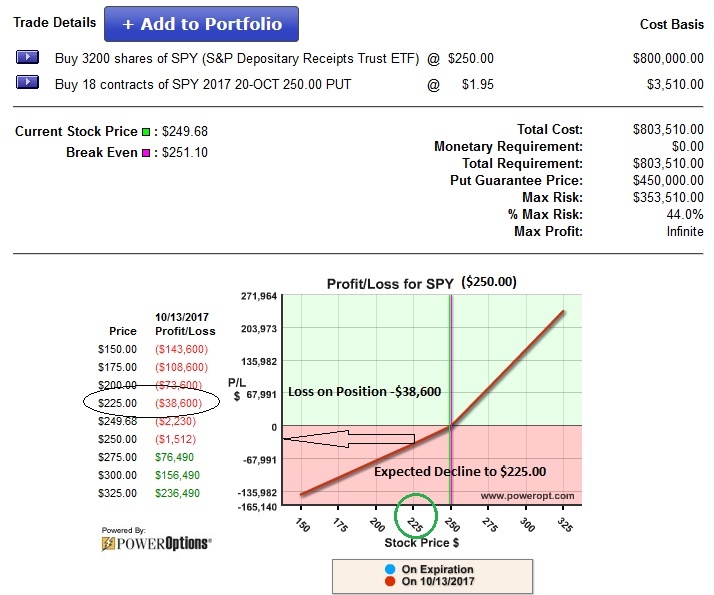 If SPY fell to $225, say on October 13th, 2017 – the put option would be trading at close to Intrinsic Value (the amount that the put option is In-the-Money). We would expect the put option to be trading at a value of at least $25.00 per contract. So, how many put contracts would we need to buy to counter half of the projected $80,000 loss? By only putting up 0.35% of our total portfolio value, or 1.7% of our remaining $200,000 in cash, we have hedged a potential -10% portfolio loss to only -5%. WE control the outcome of the position. We can not be closed out (unless we hold the put to expiration and make no adjustments) or assigned. We bought the put, we control what happens next. This is better protection against a sudden -10% market decline, over a -5% Stop Order or Trailing Stop that could be violated. We only use 3.1% of our remaining $200,000 capital, or 0.62% of our total portfolio value…AND the Max. Risk in any decline scenario is only 0.8% of our capital invested, even if the decline is larger than we thought. We still control the outcome of the position, and can not be closed out early or assigned. We have covered the full 3,200 share block with only a small percentage of our account value. We could even buy more for a higher cost and actually PROFIT to the Downside, as well! And of course, this example relates to other size portfolios, not just a $1,000,000 account. You could apply this to a $100,000 if you were 80% invested, a $10,000 account or even a $1,000 account. This is a much more cost effective and efficient way to protect against an expected market decline. Can’t I use other transactions to pay for the insurance? We all know that trading options carries risks, just like any form of investing. Many options traders prefer to Sell Premium rather then Buy Premium. However, selling premium against a security only offers a small amount of protection, compared to buying insurance. We could lower the cost of the insurance by selling a call against the security in this scenario. If we sold the 20-OCT 252 strike call, we could generate $1.10 in premium, cutting the cost of the insurance in half. This would create a Standard Collar position. However, selling a call obligates us to deliver our shares at the strike ($252.00) if the stock is trading above that price. Although we cut the risk in half, we also limit the gains if we are wrong and the market continues up in price, as you can see from the Profit / Loss chart. By selling the 20-OCT 252 strike call we lower the risk to only 0.3% of our invested capital. However, we cap the upside to only 0.5% gain, or $3,680.00 of the +$800,000 invested. This might not be a concern, as we are expecting a -10% decline in the market…but it is something to consider. What have we covered so far? Cons: Not cost effective at all! Cons: Requires Cost unlike a Stop…but you get what you pay for – peace of mind! But there are so many different ways to create Portfolio Insurance against a market decline. But first, we want to take a look at the proper strike selection to insure this example and using Put options to insure an actual stock portfolio! This is very timely as I have been contemplating just this type of strategy. Thanks for the great info and looking forward to the remaining portions. Hello Allan, I am glad to hear that you found the information useful. We should have another updated today, and more coming this week! Thanks this is really helpful for those of us looking for a little peace of mind. Hello Ray, you are welcome. I will have more information for you today, and during this week. How would you manage the married put to minimize risk and maximize profit if the position keeps going up? Please continue with the same strategy. Hello David, If SPY continued up after the insurance was in place, I would likely use one of the income methods discussed in The Blueprint applying the Radioactive Trading techniques. Income Method #6, a Bear Call spread in the structure of a Married Put is a great way to generate income but not cap the gains as one does with simply selling a call (creating a Collar). 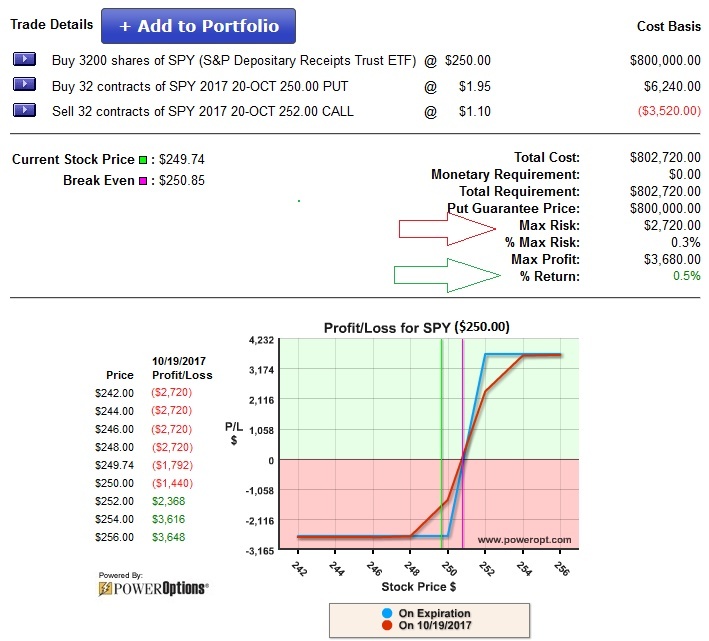 I could also adjust the put option if SPY continues up to lower any risk, although with such a short term position – that was based on hedging against a downturn not profiting in an uptrend – I might just consider letting the stock ride and using the Bear Spread (in the context of a Married Put / Protective Put) to leave the upside open. You will see more tomorrow on selecting the right strike price and further details. The section on buying shares of leveraged inverse ETFs to hedge is not very accurate. It is incorrect to suggest that SDS or SPXS will move in predictable ways over time. These ETFs track the inverse of the S&P 500 for single days only. SPXS would not probably not increase exactly 30% if the S&P 500 fell 10%.